As in the original prototype, weapons now require ammunition in order to fire. Each weapon can store a small amount of ammunition for itself, but once it runs out, additional ammunition must be delivered by the ship's crew. Individual crew hand-carry ammo bullets from a nearby ammo supply to the weapon. Notice how in the above screenshot, some of the crew are carrying ammo to the weapons. 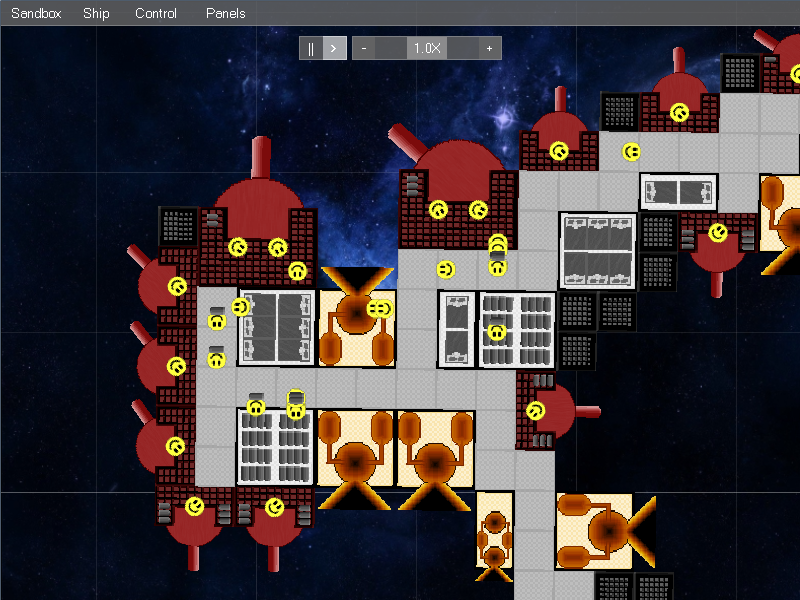 The purpose of this mechanic is to further emphasis the importance and role of the crew on the ship, and to make designing a ship for maximum crew efficiency a priority. If the closest ammo supply is too far from the weapon, then the weapon won't be able to fire as often. It will also be important to prevent narrow corridors from getting congested with too much foot traffic. Wider corridors and/or more ammo supplies may help if foot traffic becomes an issue.